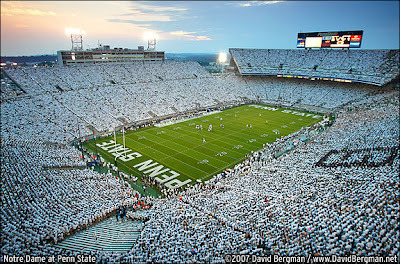 This could be the scene when Michigan visits on October 12th. Source. Last year, the Big Ten offered up 14 primetime games among it's 12 member institutions. Michigan played in 3 of them (Alabama, ND and Nebraska). Today, ESPN announced 6 primetime B1G games for the upcoming season...with more surely to come soon. We already knew about the Notre Dame primetime game set for September 7th. And we now have confirmation that the matchup in Happy Valley will be a primetime-ish kickoff set for 5PM. • I'm a big fan of the Penn State 5 o'clock kickoff time. Imagine a 5PM kickoff at the Big House...maybe on November 9th when the Cornhuskers come to town??? @DaveBrandonAD make this happen! Please and thank you. Pat Fitzgerald's crew could/should be 4-0 and coming off of a open week when Ohio State comes to town for Northwestern's Big Ten opener. It will be the most anticipated Northwestern home game in recent memory. • Two road B1G night games for Notre Dame in as many weeks early in the year. I'm a fan. I don't see it as the Big Ten elevating the Irish's stature. They just played for the national championship, plus, they're Notre freaking Dame. Deal with it. • No Nebraska on this list? They typically rival Ohio State for number of night games per year. • When more night kickoff times are added, I suspect one of them will be in November. It's been a long-standing agreement among B1G teams not to schedule November kickoff times later than 3:30 local time. I had a suspicion, and still do, that the Michigan-Michigan State game in East Lansing on November 2nd could be the first game to try and break that unwritten rule. Hollis and Brandon could work it out. It could be a marquee BTN game, I think. UPDATE: As @cdbarker pointed out to me on Twitter...there is a NASCAR race on ABC on September 7th slated for primetime. This is probably a contract thing between ESPN and NASCAR, thus it's set in stone. Although, you'd suspect the ESPN CFB people would know this and correct their press release. So it looks like, as in 2011, Michigan and Notre Dame (UTL2) will be bumped to ESPN.